Authentic Eco-Friendly Hotel with Great Ocean Views, Perfect for Families. Si Como No Resort Spa & Wildlife Refuge is a Central Pacific coast hotel, nestled in the jungle-covered hills just above Manuel Antonio National Park. It’s perfect for families with children, as well as couples wanting resort amenities and the personalized services of a boutique hotel for their Costa Rican vacation. This award-winning property blends seamlessly into its jungle hillside environment, allowing amazing jungle or Pacific Ocean views from all rooms. Si Como No’s 58 guest rooms are distributed among ten separate areas within their 24-acre private wildlife refuge. Guests will see sloths, playful monkeys, basilisk lizards, exotic birds, and more on the grounds. The charming guestrooms have rustic wooden accents and comfortable modern amenities. All guest rooms at Si Como No come with A/C, safe, fully-stocked minibar, and coffeemaker. Hotel amenities include an adult-only swimming pool, a family pool with water slide, complimentary WiFi in the lobby, pool area, and restaurants, and free scheduled shuttle service to Manuel Antonio Beach. Guests can also enjoy their THX cinema, the Cala Spa, and the gift shop. On-site self-guided tours are available to the butterfly botanical atrium, crocodile lagoon, and amphibian jungle. And don’t miss the popular after-dark tour! There are two restaurants on-site; the Rico Tico (opened all day) and the Claro Que Sí (lunch and dinner). Both restaurants have varied menu options with local and international dishes, and chefs can adhere to dietary restrictions like gluten-free or other food allergies if needed. The hotel is committed to environmental protection. 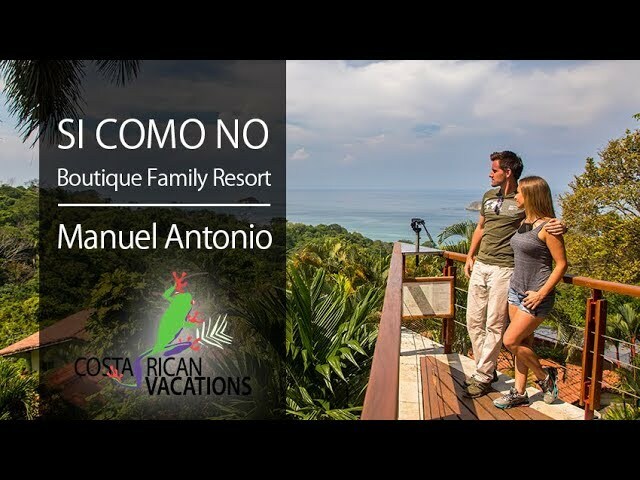 Si Como No is certified by the Costa Rican Tourism Board with a Level 5 CST (Certificate of Sustainable Tourism), the highest level available. During Si Como No’s construction, only one tree was removed from the hillside, which is one example of their commitment to the surrounding environment. Fincas Naturales Nature Reserve is a living laboratory of nature conservancy and an example of sustainable development, where you will see a variety of flora and fauna including monkeys, agoutis, and precious tropical hardwood trees. Guests can request the use of the theater for themselves and their families on a reservation basis. Si Como No boasts Regalame Art Gallery, containing locally made artwork.